Trillians is an integral part of the Newcastle rock scene, and providing a home to the cities alternative community for over thirty years. The venue has been threatened with closure on several occasions over the last few years, yet the bar's loyal supporters including Motorhead, have petitioned tirelessly every time to save it. Fortunately, new owners have always stepped forward saving Trillions. I can't remember when Trillions closed down, I think it was before Christmas. Trillians left an empty place in Newcastle as there are hardly any rock bars left. Over the last year, numerous Rock nights have started up but most of them held monthly, so there was no rock bar to sit and have a pint in Newcastle. Friday night was the unofficial opening, originally intended for families and friends of the pub management. However, they had a change of heart at the last minute and extended the invitation to every patron is considered as Trillian's family. The night resembled a last minute get together as the draught pumps hadn't been installed, alternatively served bottles and cans for £1.20. The night felt like a mates BBQ gathering with a Hi-Fi connected into the sound system, still playing incredible music. The place was crammed with former patrons supporters celebrating the return of Trill's. It felt as though everybody's favourite inebriated uncle had returned from his stint in rehab. The new owners passion and love for the place is clearly evident; it offered a rejuvenated ambiance that had been missing for a long time. 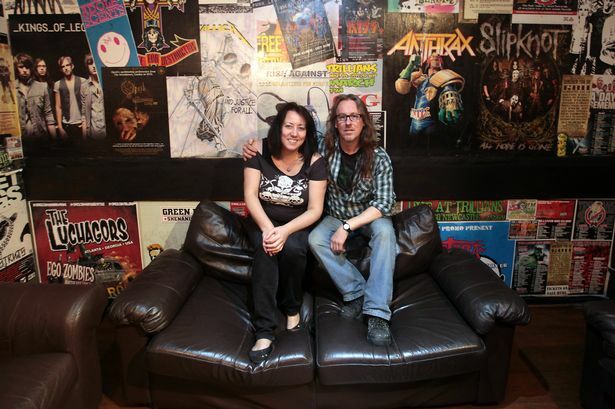 The New owners are Trillians former sound engineer, Dave Hill and loyal customer, Barbara Blair, certainly demonstrated they're more than up to the task from first appearances, they understand Trillians philosophy and its clientele. At 10:30 pm the festivities were interrupted by the fire alarms set off by somebody smoking an e-cigarette and the vapors activating the alarms. The positive side is the fire alarms work and the Trill's permitted to smoke an e-cigarette, yay. Trills is the first bar I ever drank in, and I love the place, so many memories. My husband actually proposed to me one drunken Saturday afternoon in there. So glad it's reopened, the Percys got a bit scary recently. My partner's not partial to the Percy as he has found it's deteriorated substantially.For the alternatives from Tyne and Wear Trills has a valuable and major place with so many memories to offer for anyone who crossed the fresh hold. Despite closing several times, I think it's amazing to see people fighting and petitioning to get the place open every time. I'm happy to see the place has gone to people who actually love the place. For me, I've spent many a brilliant time in Trill's and being merry lol.